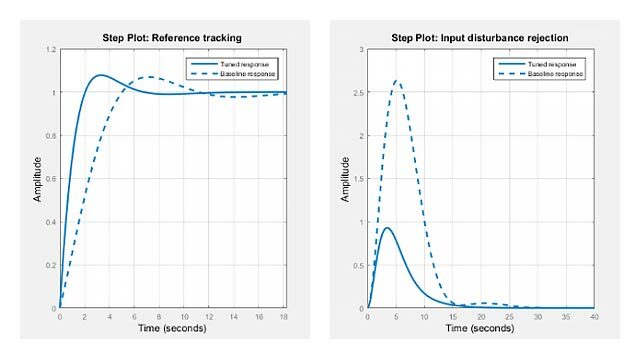 pzmap(sys) creates a pole-zero plot of the continuous or discrete-time dynamic system model sys. x and o indicates the poles and zeros respectively, as shown in the following figure. In continuous-time, all the poles on the complex s-plane must be in the left-half plane (blue region) to ensure stability. 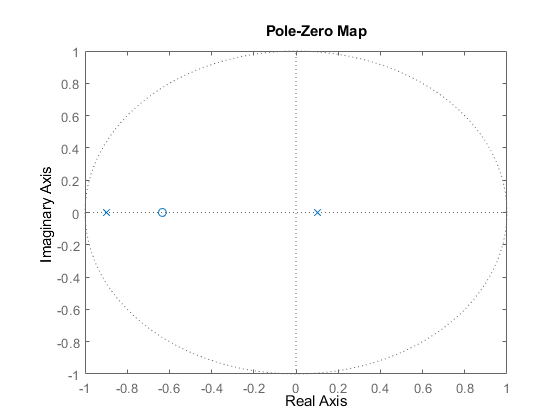 The system is marginally stable if distinct poles lie on the imaginary axis, that is, the real parts of the poles are zero. In discrete-time, all the poles in the complex z-plane must lie inside the unit circle (blue region). The system is marginally stable if it has one or more poles lying on the unit circle. pzmap(sys1,sys2,...,sysN) creates the pole-zero plot of multiple models on a single figure. The models can have different numbers of inputs and outputs and can be a mix of continuous and discrete systems. For SISO systems, pzmap plots the system poles and zeros. For MIMO systems, pzmap plots the system poles and transmission zeros. [p,z] = pzmap(sys) returns the system poles and transmission zeros as column vectors p and z. The pole-zero plot is not displayed on the screen. Turning on the grid displays lines of constant damping ratio (zeta) and lines of constant natural frequency (wn). This system has two real zeros, marked by o on the plot. The system also has a pair of complex poles, marked by x. 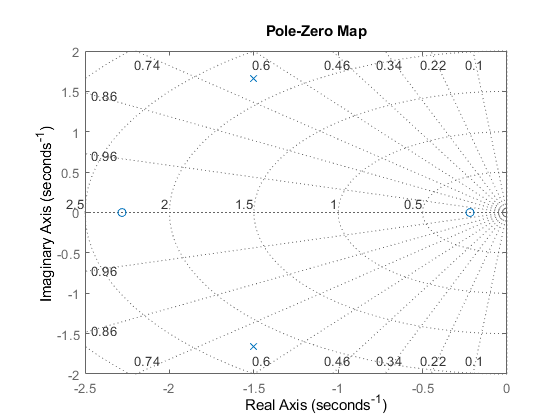 Plot the pole-zero map of a discrete time identified state-space (idss) model. In practice you can obtain an idss model by estimation based on input-output measurements of a system. For this example, create one from state-space data. System poles are marked by x, and zeros are marked by o. For this example, load a 3-by-1 array of transfer function models. 3x1 array of transfer functions. Each model has 1 outputs and 1 inputs. Plot the poles and zeros of each model in the array with distinct colors. For this example, use red for the first model, green for the second and blue for the third model in the array. sgrid plots lines of constant damping ratio and natural frequency in the s-plane of the pole-zero plot. This example uses a model of a building with eight floors, each with three degrees of freedom: two displacements and one rotation. The I/O relationship for any one of these displacements is represented as a 48-state model, where each state represents a displacement or its rate of change (velocity). State-space model with 1 outputs, 1 inputs, and 48 states. Plot the poles and zeros of the system. From the plot, observe that there are numerous near-canceling pole-zero pairs that could be potentially eliminated to simplify the model, with no effect on the overall model response. pzmap is useful to visually identify such near-canceling pole-zero pairs to perform pole-zero simplification. Dynamic system, specified as a dynamic system model or model array. Dynamic systems that you can use include continuous-time or discrete-time numeric LTI models such as tf, zpk, or ss models. If sys is an array of models, pzmap plots all the poles and zeros of every model in the array on the same plot. Poles of the system, returned as a column vector, in order of its increasing natural frequency. p is the same as the output of pole(sys), except for the order. Transmission zeros of the system, returned as a column vector. z is the same as the output of tzero(sys). Use the functions sgrid or zgrid to plot lines of constant damping ratio and natural frequency in the s- or z-plane on the pole-zero plot. 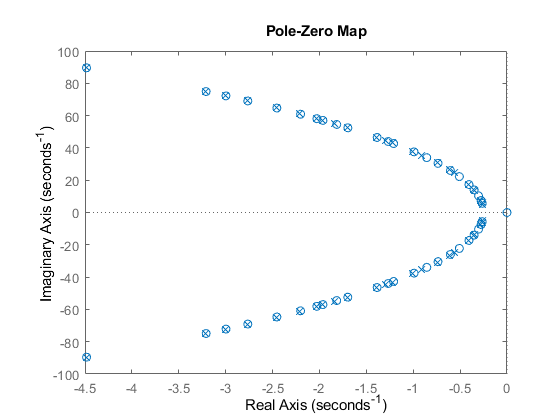 For MIMO models, pzmap displays all system poles and transmission zeros on a single plot. To map poles and zeros for individual I/O pairs, use iopzmap. For additional options to customize the appearance of the pole-zero plot, use pzplot.